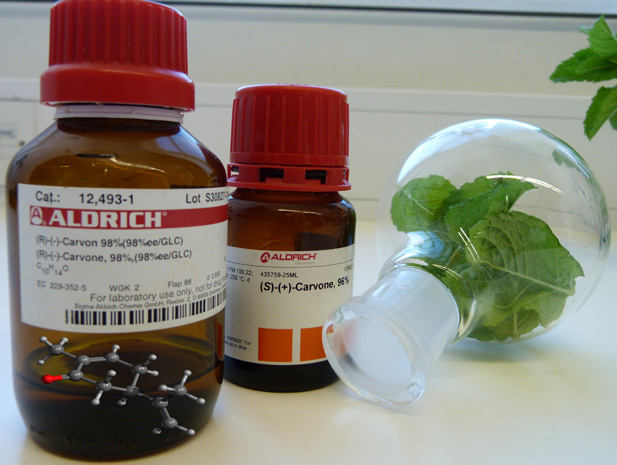 Mint leaves in a round-bottomed flask, bottles of pure carvone enantiomers and the molecular structure of R-(-)-carvone. It may be in your shower gel in the morning shower, or the fragrant perfume you apply at the beginning of the day. It may also be your herb of choice for dinner, as well as in the after-dinner breath freshener. In any case, it might be tricky to avoid mint throughout the day. Its uses are wide ranging, but what are the key components of mint and where do they come come from? Directly from the leaves? Or from a chemical synthesis? Does it matter? 1. The main picture (above) shows a bunch of mint leaves in a round-bottomed flask.The two glass bottles on the left contain R-(-)-carvone and S-(+)-carvone, which are found in essential (volatile) oils extracted from plants. The R-(-)-carvone is found in spearmint (Mentha spicata, a type of mint), whereas its enantiomer, S-(+)-carvone, is not. Its fresh, aromatic and sweet flavour with a cooling aftertaste means mint is used in many everyday products, from toothpaste to ice-cream. However, there are actually 650 species of mint, so using it as a one-size-fits-all term for a single flavour is a little misleading. This genus of plants is called Mentha and includes many different species and even more cultivars. For example, the spearmint is Mentha spicata, while peppermint is Mentha x piperita. Sometimes this cultivar is also sold as chocolate mint, and other cultivars have been described as apple (Mentha suaveolens), banana (Mentha avensis) and pineapple (Mentha suaveolens variegata) mints. The culinary applications of mint leaves are extensive, ranging from uses as a herb, particularly in Middle Eastern (and British) lamb dishes, to a key ingredient in tea, popular in many North African countries (as Touareg tea), but also used in Western Europe as it is thought to soothe digestive upsets. Rather than using fresh or dried leaves, the volatile oils can also be extracted from mint leaves using distillation, expression and solvent extraction. These oils contain the aromatic compounds that are used in toothpastes, shower gels and medicines, giving them their antimicrobial properties and refreshing sensation. 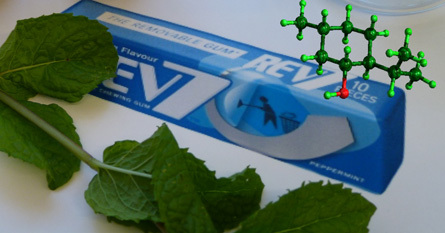 Mint leaves and the molecular structure of (-)-menthol in minty-fresh colours. Mint has been popular throughout history: in the Roman era the nobleman and writer Pliny recommended “binding the head in a crown of mint, which delights the soul and is good for the mind.” In the 17th century mint was prescribed as a “great strengthener of the stomach.” However, medicine has come a long way since then, so maybe this should not be taken too literally. Nowadays, the chewing gum industry is a big user of mint, especially spearmint and peppermint. 2. Within the leaves of different mint species and cultivars, the relative abundance of different compounds varies and gives rise to the characteristics we are familiar with. The cool aftertaste of mint leaves and products comes from a chemical called menthol (Fig. 2), which occurs naturally in peppermint. The atoms of menthol can take on 8 different arrangements in space without actually changing the order of the atoms or any of the chemical bonds, providing another illustration of isomerism and chirality (see also our post on Roses, as well as mentions in the posts on Eucalyptus, Poppy and Yew). Where such different arrangements give rise to non-superimposable mirror images, we talk about enantiomers. The difference in enantiomers is very subtle, but can be visualised with three-dimensional models of molecular structures, and it can be detected as differences in scent or taste because our olfactory (smell) receptors have chiral sites as well. Before we look at menthol in greater detail, it is worth considering a simpler example. In spearmint R-(-)-carvone determines the smell. 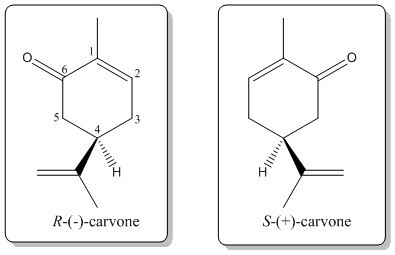 There is another form of carvone, S-(+)-carvone, and although chemically they are almost identical (Fig. 3), they are enantiomers, with R-(-)carvone smelling like spearmint, while S-(+)-carvone smells like caraway. The chiral centre is found at carbon-4 and as there is only one chiral centre, there are only two enantiomers. The aroma of R-(-)-carvone is what we associate with spearmint because the essential oils in spearmint contain 50-80% R-(-)-carvone. S-(+)-carvone, on the other hand, is 50-70% abundant in caraway and dill essential oils. Fig. 3: Enantiomers of carvone. Menthol is slightly more complex as it has three chiral centres, which results in 4 pairs of enantiomers and 8 stereoisomers. 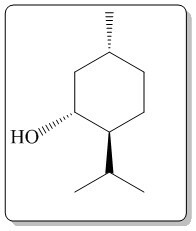 The (-)-menthol enantiomer that exists in peppermint oil is able to bind to the chiral TRPM8 receptors, which produces the well-known cooling effect (J. Pharm. Pharmacol. 1994, 46(8), 618 – 630). 3. As we have just seen, menthol has 4 enantiomeric pairs, and these are (±)-menthol, (±)-isomenthol, (±)-neomenthol and (±)-neo-isomenthol. This means that it is tricky to achieve a good yield of pure (-)-menthol, which is the desired product with the peppermint odour, by chemical synthesis. In nature, the biosynthesis is controlled by stereospecific enzymes, such as (-)-methonone reductase, which reduces (-)-menthone to (-)-menthol. However, it is also possible to design a chemical synthesis. Due to the economic importance of menthol, chemical companies fund a lot of research into efficient, high yielding synthetic routes. The Harrmann-Reimer company proposed an effective synthesis of (-)-menthol (Scheme 1), which is still used today (Patent: J. Fleischer, K. Bauer, R. Hopp, DE 2109456 (1971), Harrmann & Reimer). The synthesis begins with m-cresol (3-methyl-phenol), which is alkylated with propene to form thymol. Thymol is then hydrogenated (reacted with H2) to form a (±)-racemic mixture of menthol. The 50-50 mixture is then reacted with methyl benzoate (trans esterification) to form racemic menthyl benzoate which can be selectively crystallised to separate the isomers and then hydrolysed to yield (-)-menthol. These links give alternative synthetic routes: Menthol – A Cool Place and Chemexplore. Scheme 1: Synthesis of (-)-menthol. Rather than installing each chiral center in sequence, many synthetic route actually start from other chiral compounds (often cheaper). 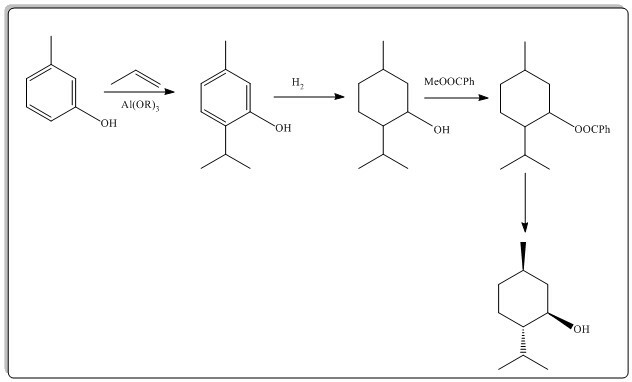 R-(-)-carvone can be synthesised from (+)-limonene, which can be extracted from waste orange peel by steam distillation. The (+)-limonene is reacted with NOCl to form limonene nictrosochloride, then pyridine is added to form carvoxime, liberating hydrochloric acid (HCl). Hydrolysis of carvoxime to the corresponding ketone can then undergo further hydrolysis to give R-(-)-carvone (J. Chem. Educ., 1980, 57 (10), 741). While these chiral compounds can be synthesised in the laboratory, natural mint oils actually contain a mixture of compounds. This can be more difficult to replicate and indeed, the ratio of enantiomers in mint can be used as an indicator of the authenticity of natural essential oils (Journal of Chromatography A, 1994, 666(1-2), 161-165). However, it can also be important to fully understand the composition of additives to cosmetics, flavours and pharmaceuticals; in these cases the isolated compounds, regardless of whether they have been extrated and purified, or prepared synthetically, will be preferable. Contributors: David Ratcliffe (research and writing), Jenny Slaughter (photography), Emma Blackham (content and editing), Natalie Fey (images and editing). Categories: Chirality, Cookery, Medicine, Plants, Scent, Synthesis | Tags: carvone, chemistry, chewing gum, chirality, extraction, food, medicine, mentha, menthol, mint, perfume, scent, science, tea | Permalink.